As a premium partner for medical coatings europcoating has worked for many years in the medical industry. This includes detailed knowledge of physical principles and material properties. Colour markings on instruments and implants can help in daily clinical practice, e.g. to rapidly find special tools. 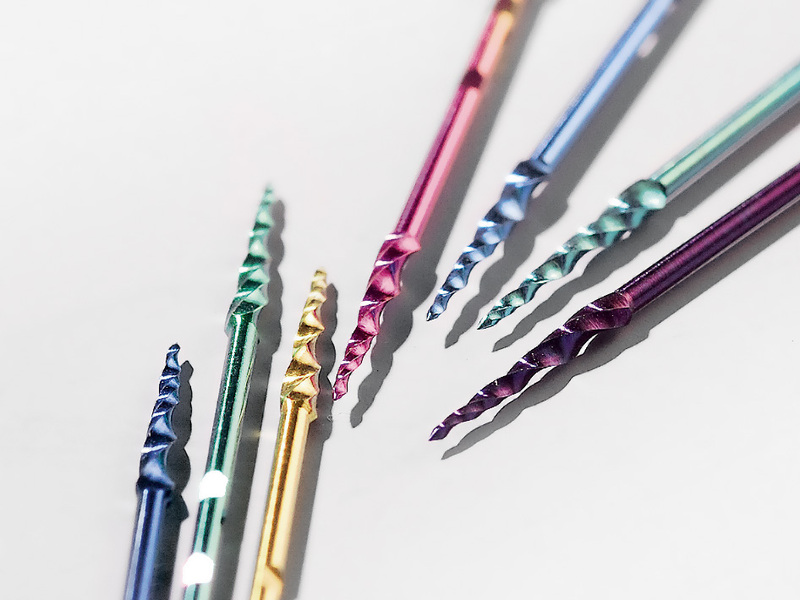 For medical devices made ​​of stainless steel, which can not be coloured by anodizing or any other process, there is the possibility of a colour-coating based on niobium. On a part made of stainless steel we first apply a thin surface (1-2 mm) of pure metallic niobium with the conventional PVD process. Subsequently, this niobium layer is stained in an anodizing bath in different ways by using different current-voltage-relations. Niobium layers are extremely resistant to corrosion and long-lasting despite intensive washing and sterilization processes. We develop medical applications together with partners.